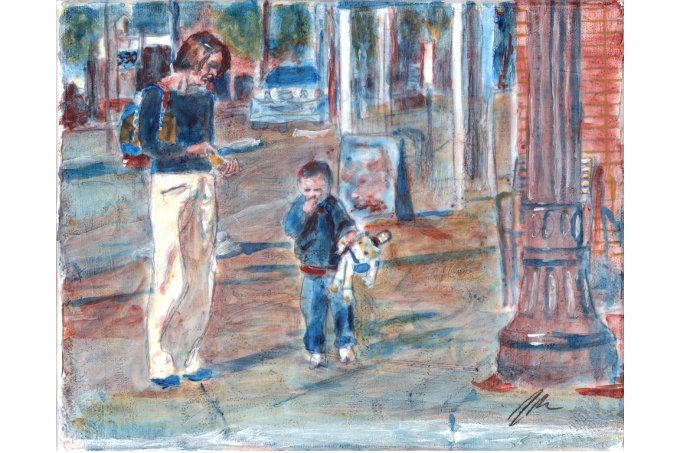 Figures in a Streetscape is a series of paintings of various sizes depicting people who live and work in my own neighbourhood, and yet remain strangers to me, as I am a stranger to them. In most the individuals are alone: in all they are alone with their thoughts, in the midst of urban density and traffic. The individuals in the streetscapes are alone, but their various solitudes fill the streetscapes. Without the solitary individuals, the scenes would be empty and meaningless. With the figures, the depth of meaning is only limited by our own imaginations. As in much of my work for the past few years, this series is executed with a restricted palette: red and yellow ochre, pthalo blue, and white. I find the restricted palette forces and allows me to concentrate on what Pliny the Elder described as the ‘effort of genius’ rather than the material of the work. Nine Figures were on display May 28 to June 14, 2009 in the lobby during Shadow Theatre’s production of Glorious. One other, “Muffin”, was a part of Diversity 2009 at the VAAA gallery from June 18 to July 18, 2009. 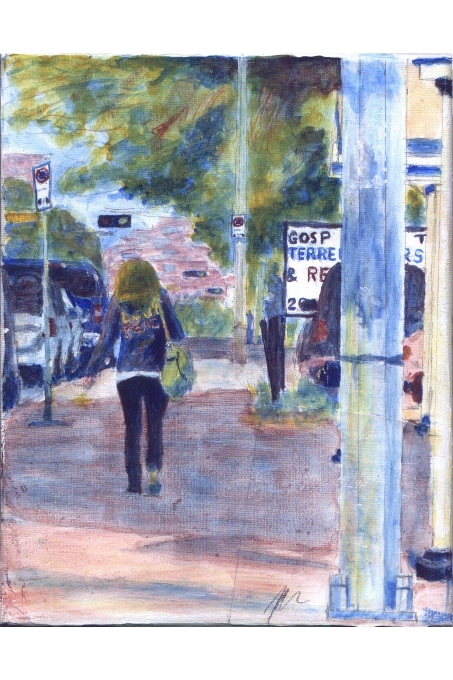 In March and April of 2010, I was “Feature Artist” at the Spruce Grove Art Gallery with a selection of the Figures in a Streetscape. The Figures in a Streetscape by John Richardson are licensed under a Creative Commons Attribution-NonCommercial-NoDerivs 3.0 Unported License.